According to the Tehenu or Libyan Palette,the first Egyptian settlement upon the western Nile Delta of Maerea consisted of 7-10 Nomes. TaJeru being the name for the Delta Nile. Today our modern scholars call this Merimda Beni Salama,a major Pre-dynastic settlement of the western Delta,about 50 kilometres north-west of Cairo. The district of Maerea included Alexandria,Sais,Buto,Naucratis,Imu (kom-el-Hisn),Hwt-Ihyt (foremost household),Prosopotis,Memphis (Mennefer),Tanta,Al Mansura,the Fayum and Saqqara. The districts of Maerea remained populated for about one thousand years until about 4000.bC.During this phase pottery was being made,often with quite sophisticated designs ( a fine polished red wear with blackened tops). Kom el-Hisn is at the edge of the Delta and west of the city Tanta,about 12km south of Kom Gi’eif (Naukratis). Here a large mound covers an ancient town probably called Imu (Jamu). From the New Kingdom onwards,this was the capital of the 3rd Lower Egyptian Nome, known as the ‘Libyan or Western Nome of Maerea’. The town of Imu is mentioned in numerous ancient texts and replaced an earlier and important provincial capital in the region called Hwt-Ihyt(foremost household),whose location has not yet been discovered and is known to date back to Dynasty I. The site of Kom el Hisn was visited by Petrie in 1884 and surveyed by F Llewellyn Griffith in 1885. The monuments were later mentioned by Georges Daressy and excavated during the 1940s by Egyptian archaeologists, A Hamada, M el-Amir and S Farid. When F Llewellyn Griffith visited Kom el-Hisn, most of the mound was still extant with visible mud brick fortressed walls averaging 350 feet by 200 feet and the foundation of a pylon.The town of Imu was occupied at least from the Old Kingdom and mentioned in texts since the Fifth Dynasty. The main part of the mound is now covered by the ruins of a temple built by Senwosret I (Sesostris) of the 12th Dynasty. Let us take into consideration my theory of the Royal City of Atlantis being built at Josephine Seamount ca.5128.bC from my interpretation of the nine thousand years by a 2.45 divisional factor of recorded successive generations for Atlantis as preserved by Plato ca.360.bC from Solon ca.570.bC. Evermore we realize from Radio Carbon dating and geologist reports that Lower Egypt thrived prior to Upper Egypt of which most likely became settled as the Tasian cultures of Maerea. TA meaning Earth,Land,Terra or Tara alike Tajeru or Atlantis as the "Foremost of God JA MN's Island of Earth or HAt.ta.Ntr.Iw." Where Atlas or HAt.Ja meant "Foremost Ruler or King of JA's Lands". Alike the Red,White and Black stones common for Atlantis,we notice that "sophisticated" red and black topped pottery was a common footprint of Maerea and also having been settled around the apex of our Royal City of Atlantis. As provenanced,Khenti-Amenti Rosetau or Foremost of the Western Island of Atlantis was not only recorded in the Egyptian story of the Sun's Journey for the Am-Duat, but also according to the Field Measures of the Am-Duat,pointing precisely to the Atlantis Royal City at Rosetau Josephine some 500 miles before the Straits of Gibraltar and exactly as Plato preserved. To further provenance this very fact, Atlantis Rosetau was mirrored exactly alike at Maerea Saqqara as evident by the Am-Duat's picture of usurper Sokar the horus follower and not of Amen's Falcon. This picture portrays the Tatenen primordial mound of Atlantis mounted by the head of Calypso (Cleito) looking Eastward and surrounded by an oval rectangular Canal that was bordered by two Lions (Maia). The Atlantean Twin Pyramids,the Great and The Red also bordering the Canal while the collossal statues known as Memnon,would have been centered at the Canal to Greet the Sun in Saqqara Rosetau. Evermore,the Sun would journey home to Atlantis Rosetau at Josephine Seamount's Royal City that was exactly as mirrored in Saqqara Rosetau. 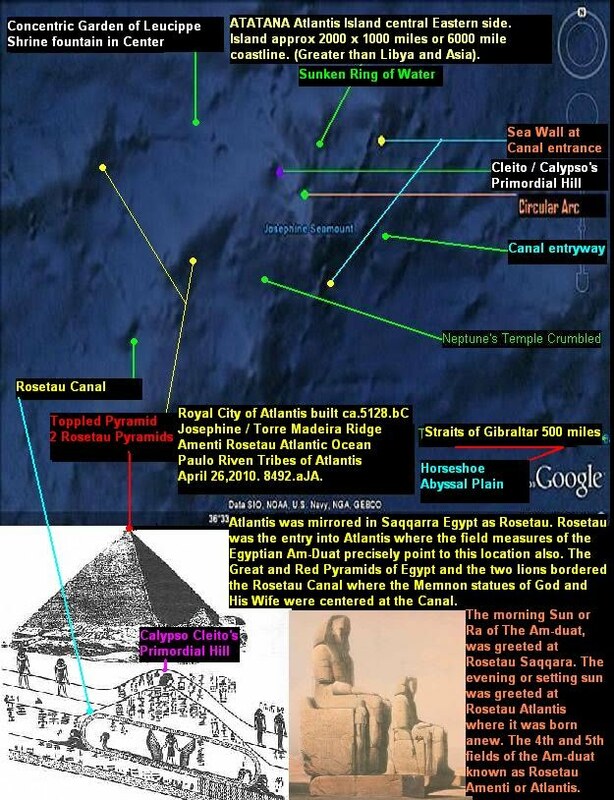 The evidence clearly seen on my NOAA US NAVY, Google Earth Satellite Atlantic Ocean picture,where we do in fact see 2 pyramids (one toppled) the Oval Canal,the hill of Calypso,concentric rings and the fortressed wall that would have been at the ancient coastline and Rosetau entrance for the Canal to Atlantis Royal City of Evanor. Also,at least 8 times the District of Tejataru is mentioned on the stone. 3 times in row 4: sq 8 as niwt Tejataii nwb,sq 10 as niwt Tejataii nwb, sq 12 as niwt Tejataru.ta (district of Tejati's Golden lands and district of the land of Tajetaru. Obviously, Lower Egypt being named TeJata after Menes's first twin Son and testimony that the Captiol City of Maerea was named after Menes's Wife Maereata (Maat or MereNeit). Maerea being composed of 3 districts for Double Falcon,Scorpion and Lion and probably why Petrie thought it was the 3rd nome when in reality it was the First or main Capitol. Evermore,solid proof that the Atlantean district of Maerea were the founder's and builders of Egypt with their highly advanced tribes and unlike the barbarian hunter,gatherer's of upper Egypt. Just as we have solid proof of Jasa,the temple of fire,the bright star and Christian Cross of Amen five thousand five hundred years ago! The Cross is visible in many locales for Egypt including the Abu Simbel Temple and even in Hatshepsut's beautiful building. The ankh, originally being split to resemble a human with legs,arms and head,simply meaning life but not creation like the Cross from Atlantis! Properly a Cross inside of a Circle and touching the circle borders with a long stem like the Canal! I am still shocked by the fact that 4 years later I discover undeniable proof of Jasa being murdered at The Temple of Fire just as I predicted and envisioned!Let alone finding God's Son 5,500 years ago! Amazing grace! Merimda Beni Salama or Maerea was thought by Petrie as being classified as the 3rd nome of Lower Egypt. The Tehenu palette also shows the Double Falcons,Scorpion and Lion as being a trio of cities with 3 tiny blocks in each of those 3 nomes,meaning that they were the 3rd nome of Maerea. Maerea being the main district or City with sub-divisions,states or provinces on the lands of Tejataru Lower Egypt. As evident from the scholarly,archaeological and geological reports, Maerea was in fact quite different than the rest of Egypt and more highly advanced having come originally from the island of Atlantis. Upper Egypt being mere barbarians in a sense and as noted for the fact they appear tribal some one thousand years after Lower Egypt and as offshoots of them with their Nubian mergers of the disgraceful Khaka kings who called themselves pharaohs! Exciting because Maerea really identifies that these tribes were in fact Atlanteans! Chew on that Khaka Zahi Hawass head!